Not quite a lazy Christmas for me. I am spending my day trying to capture a black wild horse, which I got as a commission last Sunday in the Street Gallery. Blue sky, blue sea, black horse: A „Night mare“! I´ll tell you the story and show you the horse when I catch him... if I succeed! In case you are doubting: no, it is not the black horse on the photo. The dog... well, yesterday afternoon we went to the beach, with the intention to hand out the Happy Christmas leaflets to announce the birth of The New Star Goodaboom. It was not quite the right day to do it, as the weather was awful, and nobody dared to venture their noses onto the promenade. At least there were cars there and we put a 120 leaflets on them... Good Luck, Goodaboom! The sea was rough, high waves as never seen before here. I walked close to the seas´edge to take some photos. In the background I heard Kevin consumed with laughter because some of the waves were overtaking me. By the way I´m amazed that my camera survived the shock... never mind the dog! He was there with 2 men –no respite for dog owners, they had to venture their noses!-, continuously casting stones into the sea to amuse the dog. Considering the height of the waves, the young dog hesitated to run after the first stones, but eventually could not resist. He gathered his pace.... and ran full into a wave! Within a fraction of second he had disappeared completely into the boiling foam. We all stared at the point where the dog disappeared, anxiously waiting for a glimpse of black to appear again within the big white chaos. Later, as the man tried to repeat the fun, the dog started running but always stopped short at the last moment before he reached the waterline. A fantastic example of how quickly dogs can learn... at least when the lesson is hard enough! 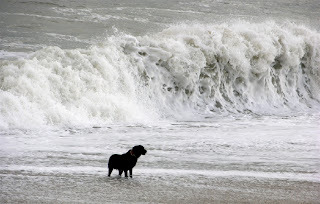 Eventually our doggy even demonstrated a certain blasé attitude to the high waves, turning his back on them... but he never went back into the sea!